This review is of the cut shown at the BFI London Film Festival in October 2017 – the UK release date is currently listed for February 16th 2018. Admittedly, I’m a little biased when it comes to reviewing a Guillermo del Toro film; in my opinion, he’s one of the most masterful creative filmmakers of all time, and even at his weakest will still give you a visual feast of bizarre imagery that’s hard to say no to. Over the years, films of his like Pan’s Labyrinth, Pacific Rim and Crimson Peak have ended up on my own personal list of films worth remembering from that year because of the sheer craftsmanship that goes into every single frame, from the sets to the effects to the characters, so when a new one of his films comes out I am pretty much guaranteed to at least like it quite a bit. But even I was taken aback by The Shape of Water, for which the word doesn’t yet exist to describe how much I loved every single moment of it. It is probably my new favourite film of his, and thanks to the embarrassment of riches in the direction, the characters, the story, the dialogue, the acting etc, it might even be one of my new favourite films, period. It takes place in the Cold War-era of the 1960s, where a mute woman named Elisa (Sally Hawkins) lives a lonely existence in her small apartment on top of a cinema (a concept which already made me fall in love with this movie), with only her elderly gay artist neighbour Giles (Richard Jenkins) to call her close friend. Every night, she goes to work as a cleaner at a top secret government facility, where she and fellow cleaner Zelda (Octavia Spencer) are assigned the dirtiest of messes to clean up from their superiors. It is during this job, at this place, that Elisa soon comes into contact with the facility’s most valuable asset: an anthropomorphic sea monster (Doug Jones) that, like Elisa, cannot communicate due to its warped biology – which is like Elisa in the sense that, as a child, her vocal chords were ripped out in an undisclosed manner. A strong connection forms between beauty and beast, and she soon makes a plan to help the creature escape from its cold and monstrous handler Strickland (Michael Shannon) and the facility where it is being kept. The scope of imagination in del Toro’s mind is beyond fathomable, and it is no less fantastic to witness here; he clearly takes cues from films of the past and lovingly homages them here, and whether it be B-movie monster films or even tap-dancing musicals, there’s not one type of film from an era long since gone that he does not pay passionate respect to in some way shape or form. They never feel out of place or tonally inconsistent, either, because it all matches up to what the characters are feeling or desperate to confess in a world that robs them of that simple pleasure, and they are performed with such style and grace by the actors that you feel every single emotion without some of them even vocalising them in verbal dialogue. Sally Hawkins delivers a truly astonishing physical performance, acting mostly with her eyes and hands to indicate sign language, and in parts expressing a true fearlessness that instantly makes her an utter delight to watch. Michael Shannon, too, gets to show that his frightening character is more than just a mere villain; what the film does so brilliantly with a lot of the supporting characters is that we spend a time with them just seeing what they like doing and how they are in conversation with other people, and we get to see Shannon’s character interact awkwardly with his family and even a car dealer, which helps us understand his desire to actually do something worthwhile while at his job, even though that thing is the very definition of evil in this situation, making him a three-dimensional person instead of the cardboard bad guy he so easily could have been. Literally everything about this film, from the visual effects to the set designs to the cinematography – which is beautifully lensed by Dan Laustsen, del Toro’s cinematographer on Crimson Peak – is just breath-taking in scope and execution. The scale of likability of its characters is off the charts, and you genuinely grow to love these people as you get to know them more and see how good-hearted a bunch they really are, even the creature itself which is a brilliant combination of make-up effects and CGI, both of which are practically seamless and always make it look like the creature is really there at all times. del Toro’s direction remains as loving as ever, but here it feels even more passionate and meaningful than ever because this is not only a story he so clearly wants to tell, but he also tells it in a way that causes euphoria with every little piece of whimsy it displays. It is a reaffirming and truly outstanding piece of work, and I can see it easily being recognised a lot over the forthcoming awards season, that is if Academy members can overlook the initial weirdness of it being a meshing of B-movie horror and romance, which given that they heavily awarded Mad Max: Fury Road a couple of years ago – which I think we all need reminding had a heavy metal guitar that spewed fire whenever played, because everyone deserves to remember that – shouldn’t be too hard for them to accept this as well. It’s only a shame that this isn’t currently scheduled for a 2017 release, because if it were then The Shape of Water would easily be at #1 on the end-of-year best list. But I guess that gives UK audiences something to look forward to in the new year, and I eagerly anticipate their reaction to what is simply one of the best films I’ve seen in years. 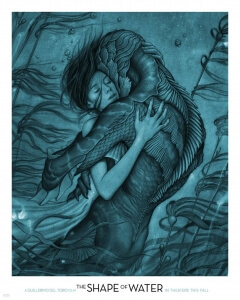 The Shape of Water is a truly phenomenal piece of work by Guillermo del Toro, who has crafted a beautiful love letter to all types of films from a bygone era, and makes sure that everything from the visuals to the acting to the story matches the true beauty at its centre. You cannot afford to miss this, especially when I consider it to be one of my new favourite films.